LOCATION! LOCATION! LOCATION! 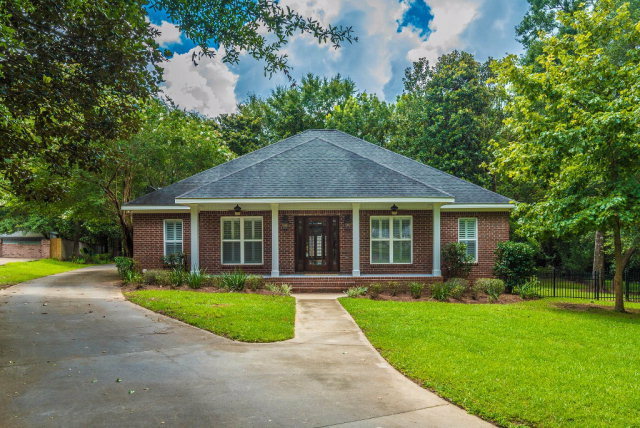 In the heart of Magnolia Springs, this custom built home is only 15 minutes from Fairhope and only 20 minutes to the Gulf's most beautiful beaches. This 3 BR, 3 BA home features 9-10 ft ceilings, reclaimed heart of pine floors, solid wooden doors, all stainless steel appliances and a 4 car garage along with a Sunroom and office. The surround sound is not only inside but can be accessed on the front porch, back deck and garage. The oversized deck overlooks a beautifully landscaped fenced in backyard loaded with fruit trees. It also has extra storage with an outside storage building. The Master has his and her walk-in closets and Master bath has jetted tub and a separate walk-in shower. The other bedrooms have large closets. The 4 car garage has a large walk up floored attic that provides amazing storage. The gasoline operated generator is a whole house generator and remains with the house. All appliances remain including the washer and dryer. Don't miss the custom crown molding and beautiful custom shutters. This house has everything you need and all on one level. Come enjoy the tranquility of this quiet neighborhood with no busy traffic. It is only minutes from great shopping, fabulous restaurants, the Magnolia River and the Gulf beaches. You can even walk to Jesse's restaurant! LISTING BROKER MAKES NO REPRESENTATION TO SQUARE FOOTAGE ACCURACY. BUYER TO VERIFY. Directions: South On Co Rd 49, Cross Bridge, Right Into Village Green Subdivision, Left And House On Left.